OBS’CEREVANCE is a French, nationwide prospective cohort that includes children with chronic ITP, AIHA, and ES. Patients with a neurological involvement were described. Centralized radiological and pathological reviews and genetic analyses were performed. 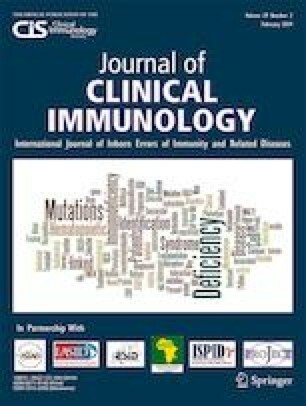 On October 2016, eight patients (7/181 ES, 1/371 AIHA, and 0/615 ITP) were identified, all male, with a median age (range) at cytopenia onset of 11.5 years (1.6–15.8). Neurological symptoms appeared with a median delay of 6 years (2.5–18) after cytopenia and were polymorphic: seizures (n = 4), cranial nerve palsy (n = 2), Brown-Sequard syndrome (n = 2), intracranial pressure (n = 2), vertigo (n = 1), and/or sensory neuropathy (n = 1). Magnetic resonance imaging (MRI) showed inflammatory lesions, confirmed by pathology for five patients with macrophagic or lymphoplasmocytic infiltrates. All patients had other relevant immunopathological manifestations: pulmonary nodules (n = 6), lymphoproliferation (n = 4), abnormal immunophenotype (n = 8), and hypogammaglobulinemia (n = 7). Treatment consisted of steroids that improved symptomatology and MRI. Five patients relapsed and three had an asymptomatic radiological progression. A PID was identified in 3/8 patients: 22q11.2 microdeletion (n = 1) and CTLA deficiency (n = 2). The online version of this article ( https://doi.org/10.1007/s10875-019-0594-3) contains supplementary material, which is available to authorized users. TP, BN, JLP, FRL, and NA designed the research, analyzed the data, and participated in writing the paper. HDLP reviewed the MRI. PV and AG reviewed the pathology samples. HF was the data manager and performed the statistical analyses. FRL performed the biology molecular analyses. BN, JLP, NA, GL, TL, HC, GM, MP, FM, OH, AM, MHu, HZ, MHa, JMD, and YP were in charge of the patients and participated in data and blood sample collection. All authors critically read the manuscript, approved the final version, and agreed to be accountable for all aspects of the work. The clinical database OBS’CEREVANCE was funded by the GIS-Institut des Maladies Rares (INSERM); the French Ministry of Health (Rare Disease Plan, PHRC 2005); the Association Bordelaise pour l’Avancement des Sciences Pédiatriques (ABASP) research charity; the Association pour la Recherche et les Maladies Hématologiques de l’Enfant (RMHE) research charity; and the AFSE and O-CYTO patient associations. TP has received a funding support from LFB biomedicaments to attend the 2017 European Hematology Association Annual Meeting. The authors declare that they have no other conflict of interest.